As a family we are becoming increasingly aware of our impact on the environment and try to mitigate this where possible. This is a vision that we have seen reflected by the majority of our guests so it seemed only natural to move the business forwards by making changes towards a more sustainable experience. 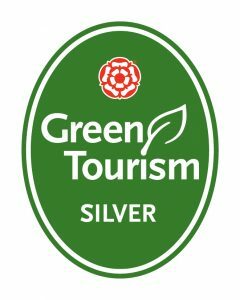 While our business has always been green we have made some recent improvement and a proud that say that we now hold a Silver Green Tourism award. When you book a stay at Farmstead Glamping we want you to be assured that we have done everything possible to minimise our effect on the environment. Your shepherds Hut is off the grid and powered by its own Solar Panel. The Shepherds Huts were produced locally (less than 15miles) and made using local and responsibly sourced materials. The majority of the products and in the Shepherds Huts are locally sourced. The sinks for example where hand crafted 10 miles away. Local Teas and Coffee that display the Rainforset Alliance Badge. Food Hampers contain all local produce. Neals Yard Organic Hand wash and Lotion. The accommodation is stocked with Who Gives a Crap toilet paper. Refillable Ecover cleaning products are provided for guest use and used during change over. Washable microfiber cleaning cloths are used to clean the Shepherds Huts. Recycling and food waste bins are provided by the accommodation. Members of the Towns ecommerce group. Here’s what we would like you to do. Use the recycling bins provided. Support the local economy by buying local produce and products and the local services such and the fantastic cafe’s and pubs Sturminster Newton has to offer. Reduce you Carbon foot print by leaving your car behind and exploring the local area on foot.